Powdered coconut milk acts to thicken the frosting, while eliminating the greasy taste that comes from not using powdered sugar. Powdered coconut milk should be available at your local Asian grocery store for a reasonable price. The kind I used comes in a can, but I’ve seen it in packets. Dairy-free readers might want to know that coconut milk powder does contain a milk protein (casein), so it’s not dairy-free (here is a dairy-free cupcake topping). Powdered coconut milk to contain 1.5 grams of carbs and 45 calories per tablespoon based on these nutrition facts. You might want to make just a small batch of this frosting–it’s that good! For a small loaf cake, prepare a 3″ by 6″ aluminum loaf pan (disposable kind from the supermarket is fine) by lightly oiling the sides with your fingers. You can use EVOO cooking spray, or a bit of coconut oil on your finger to do this. Place a small rectangle of parchment paper or wax paper in the bottom of the pan. Dust the bottom and sides of the pan with a sprinkling of oat flour to ensure the cake can “climb” as it bakes. Turn and shake the pan with your hands to coat the sides evenly. If you are making the carrot cake as mini muffins, I highly recommend you get some silicone mini muffin cups. Mine are made by Wilson, and they come in a set of 12. You can find them at Michael’s, Bed, Bath and Beyond, or possibly a store like Home Goods. 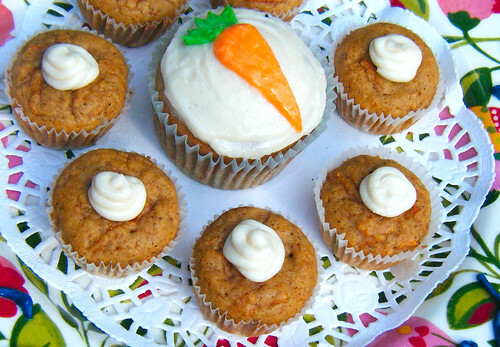 Otherwise, the carrot muffins will be just as tasty, but will stick to the paper wrappers. If you are using paper mini muffin cups, spray them with some EVOO cooking spray. Spoon batter into cups with a regular spoon (a teaspoon), filling them almost to the top. If you only have one mini muffin pan, you can make 2 regular-sized muffins with the extra batter. Use paper cups in this pan as well, and use the 2 center wells to keep the pan evenly heated. Sift coconut flour, gently spoon into measuring cup, and level with a knife. Add coconut flour to a mixing bowl along with oat flour, xanthan gum, cinnamon, baking powder, and stevia. Add pecan meal if you are using it. Whisk together dry ingredients to get rid of any lumps. Grate carrots, measure them by packing them gently into your measuring cups, and transfer shreds into a clean tea towel. Fold the tea towel over the shredded carrot several times. Wrap the tea towel-carrot package in a larger hand towel. Press down on the whole bundle to get the moisture out of the grated carrot. I recommend stepping on the bundle several times to use all of your body weight to extract the water from the carrots (fun for the whole family!). Unfold the towels to expose the dried carrot shreds. To get less visible carrot pieces in the cake, use a blender in preparing the batter. Add eggs, oil, vanilla, and molasses to a blender. Spoon erythritol, xylitol, and sea salt into blender. Add 1/2 of the carrot shreds, and blend briefly until the mixture is smooth. Add this wet mixture to the dry mix, and whisk it together. Fold in the second half of the carrot shreds. Fold in nuts, if using. Pour batter into prepared pan, and bake as directed. If you don’t have a blender, or don’t want to use one, you can use a hand mixer. The texture of the cake will just have more visible carrot pieces in it. Beat the wet ingredients together for a minute using your hand mixer. Add the dry ingredients to the wet, and beat the batter until it is smooth. Then, stir in the grated carrot with your spatula. Fold in nuts. Pour batter into prepared pan, and bake as directed. If you are making a loaf, bake it for 50 minutes. If you are making mini muffins, bake for 22 minutes. If you are baking regular sized muffins, bake for 25 minutes. Let carrot cake rest in pan until it is cool enough to touch, then transfer to a paper towel-lined cooling rack. When cake is completely cooled, transfer it to a tupperware container or zip top bag, and store on the counter for as long as 24 hours. Refrigerate it for longer storage. This cake tastes best at room temperature. Powder erythritol and xylitol together in a coffee grinder until very finely ground. Leave cream cheese and butter out on counter to come to room temperature. Cube butter with knife (doesn’t have to be exact) and add to bowl along with cream cheese. Beat together with a hand mixer until smooth. Add in erythritol and xylitol mixture along with the vanilla. Beat until smooth and fluffy (30 seconds to one minute), until erythritol and xylitol are dissolved and no longer gritty feeling. Beat in coconut milk powder. Add stevia, taste, and make adjustments as necessary. And now, I’m off to catch up on answering your emails! Hope you are having a wonderful summer, readers. « Spring Weather Means Coconut Cream Pie (take 2)! I've missed your posts! Glad to see you're back! I made a carrot cake using your black bean chocolate cake recipe. I just used white beans instead of black beans,added some carrots(about half a cup) and some cinnamon and nutmeg.Topped off with your cream cheese frosting.My family did not even let it sit over night, it was that good! Thanks!!!!! Tiffany – It's so cool that you turned the white bean cake into a carrot cake. Thank you for sharing your clever modification! Glad your family enjoyed it. Sadly, most people who are gluten free can't eat oats. They're often heavily cross-contaminated with gluten, or people can react to avenin like they do gluten. Can you suggest an alternative to the oat flour? You can also buy Bob's Red Mill gluten-free whole oats at major grocery stores, and grind them up into a flour in your coffee grinder. If you know that you can't tolerate g-free oats, then try any of the lower starch g-free flours in its place except for coconut flour or a nut flour. Hope that helps! Hi Miss Lauren: Hate to be dense, but is the 1/4 optional pecan flour for substitution purpose if one would prefer it instead of coconut flour? Or just added to the recipe/ Thank you for clarifying for me. Erythritol does not affect my blood sugar at all, and xylitol very little, Philis. I was curious. I tested, fasting, with a mug of tea sweetened with two teaspoons of the chosen sweetener, and took readings at ten minutes, a half hour, one hour, and two hours. You may want to look twice at what you're using the sweeteners to sweeten.Food combinations count. I limit my intake of carrots, but I would jump at this recipe using, say, zucchini. Also, eating too large a portion will always, always make my blood sugar pop, even if I don't eat anything but a steak. Lauren, my efforts at making a low-carb empanada shell have been resulting in a crust like crumbly cookies rather than a pastry; it's very frustrating. I'm trying to keep it gluten-free, but this may be a case where it can't be done. Before I give up, what have you and others done successfully to make a dough stretchy and pliable? It looks lovely. I wonder what happens if you leave out the xylitol? I won't have xylitol in the house, let alone in any food I eat – as it's *extremely* deadly to dogs. And I hav a dog who loves to eat anything not nailed down. I just can't have food in the house that might kill her. The cake is plenty sweet with erythritol and the stevia. You could leave out the xylitol if you like – it would just taste a bit "cool" if you add too much erythritol to compensate. The fructose in agave may increase your triglycerides, so I haven't tried it. The calories an carbohydrates (in the form of sugar alcohols) in erythritol are supposedly negligible. Hope that helps! Have you tried adding xanthan gum to your empanada dough? Scalloway – Another tablespoon of E should work. The carrot cake might have a bit of a cooling sensation, but if you are used to that effect of E, you probably wouldn't notice. I understand the fear of xylitol with pets around. I'll make a note of that in my upcoming post about sweeteners – thank you! 🙂 Sounds and looks amazing! I cannot wait to try it. Carrot cake is one of my favorites. Welcome back! You have been missed. This looks amazing and I can't wait to try it! Ariana, I am thinking that 3T of protein powder and another T of oat flour might work. I would need to get more erythritol before experimenting with a coconut free version. 🙂 I ran out after making the cake so many times! Tressa – I hope you get the chance to try the recipe! These were totally delicious! I didn't have oat flour on hand so I used almond flour instead and they were fabulous. I blended all the carrots to hide the texture a little more. My 16 year old gluten free daughter was very, very, pleased. Thanks! This looks interesting. I'm not gluten-free but I want to reduce my flour intake so I might try this soon. I did notice, however, that it contains blackstrap molasses, which I would think makes it not exactly sugar-free (at least not for someone with cane & beet sugar allergies). I'm planning to substitute date syrup, which has worked well for me in the past in this capacity. WOW! Thank you!! I'm on a really strict diet right now, can't have any starch or sugar. Do you think almond flour instead of the oat flour is best? Any suggestions for what to use instead of the molasses? Sorry to be a bother. Mid July I'll be able to try it as is =) You're the best! Suzi, I'm so glad to hear the carrot cake worked with almond flour. Ainnl, you're right about the blackstrap molasses. I adjusted the recipe notes to explain what it is and why it is used. 🙂 I hope date syrup yields good results for you! The molasses is important only as a flavoring agent – it does add significant sweetness to the carrot cake. 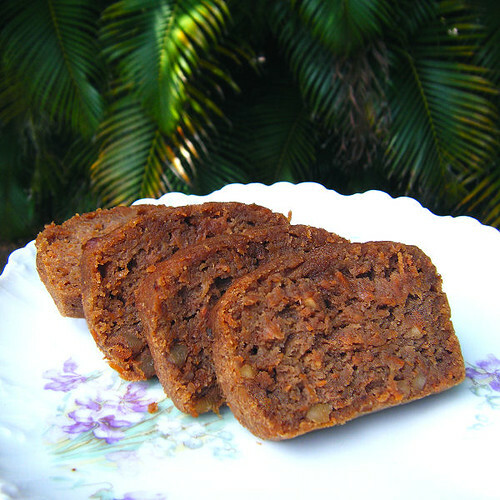 Ann – Oat flour yields a nice cake-like texture to the carrot cake. I'd certainly keep it if you can eat it. Another reader did try the recipe with almond flour, she said it worked well. Blackstrap molasses can't be substituted in terms of flavor, but honey could serve in its place. The carrot cake would just be less carrot cake like. 🙂 Hope that helps! I've been craving carrot cake for months. This looks like a wonderful, low-carbed recipe, and can't wait to try it for my next family gathering, but I'll have to buy a few ingredients first. I'm new to low-carb, and have chosen to go this route to help control diabetes, but I've found that a lot of the ingredients listed in low-carb recipes are expensive and hard to find locally. The only stores I have to choose from are Walmart and Kroger, but I'm making a list of things to eventually buy on-line from Netrition. Thanks for the recipe, and keep up the great work. Congrats on your graduation, too! It is yummy to see this lovely carrot cake I definitely try it to make.thanks plz do share more cake recipe. Darn it! I'm sad. I wanted to make these today, and no one in my town sells coconut milk powder. On hand I only have dried coconut, coconut milk and coconut flour. I've searched for a substitution, but I'm finding nothing. Ideas on what I might use? Thanks! Wildner, do you have any ethnic grocery stores in your town? I buy the product locally at an Indian grocery store. Unfortunately, there's no substitute for it in this frosting. No, unfortunately I don't, but used the solids in a can of coconut milk and it worked great! BEST FROSTING EVER! I've now made these twice in the last week…because they've gone missing so fast! 🙂 I did order the coconut milk powder online so next time I'll make them properly. Lauren, I love everything you make & have tried lots o' your recipes!!! !…especially the sugar free, dairy free, gluten/grain free as I have super awesome candida issues & a sweet tooth…..a match made in heaven! I just ran across these bars at my local health food store and thought if you didn't know about them already that you might want to. I will say that I bought one and as far as taste is concerned, they've won me over! & they have chocolate chips which would take a step out of the process for some of your recipes! They also sell the ogliofructose as a sugar substitute on the website?!! Check em out! Would love to know what you think! Pezidesi – I have tried those Chocoperfection bars! They are very good, aren't they? The cost and availability is an issue for me, but when I come across them they're a nice treat. Thanks for reminding me to keep my eyes peeled for those! I made this last week and it was amazing. It tasted totally trashy and only lasted one day. This morning, my 7 year old daughter asked me to make this as her birthday cake (her birthday isn't until July). I think she just sits around and fantasizes about food, like her mama. 🙂 Thanks for sharing. You're awesome! Has anyone omitted the xylitol in the frosting on this one? I saw where people left it out of the cake, but I'm not sure about the frosting. Thanks!